Wakatobi Dive Resort is widely considered to be one of the world’s premier diving destinations, as well as one of Indonesia’s most sought-after nature resorts. 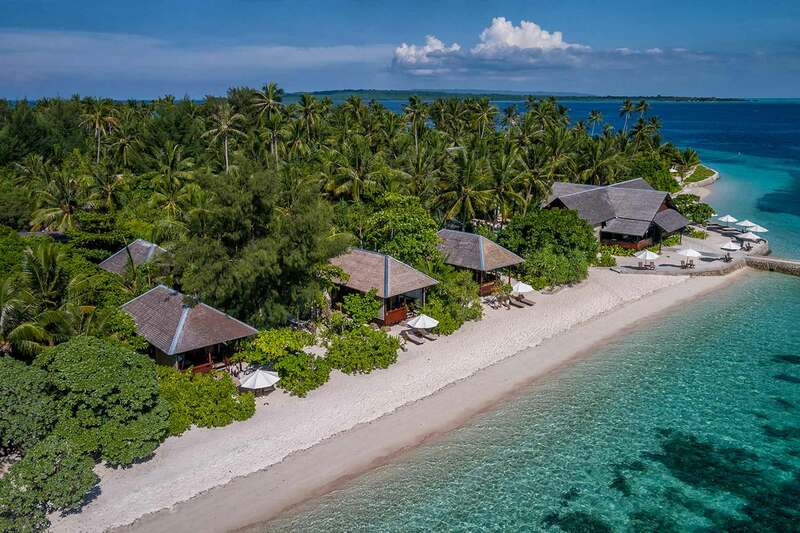 Built and operated in an ecologically conscious manner, Wakatobi’s spectacular natural beach is surrounded by miles of vibrant, unspoiled and protected coral reefs. 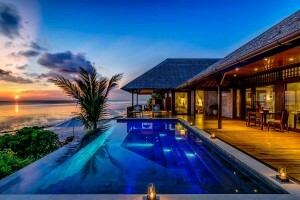 The resort is comprised of a mix of 26 exquisite seaside villas and bungalows scattered about lush landscape, creating a tranquil refuge for those seeking a unique combination of “barefoot luxury” and exceptional diving and snorkeling. The resort maintains a four-to-one staff to guest ratio to ensure the highest level of personal service, and provides direct charter flights from Bali. 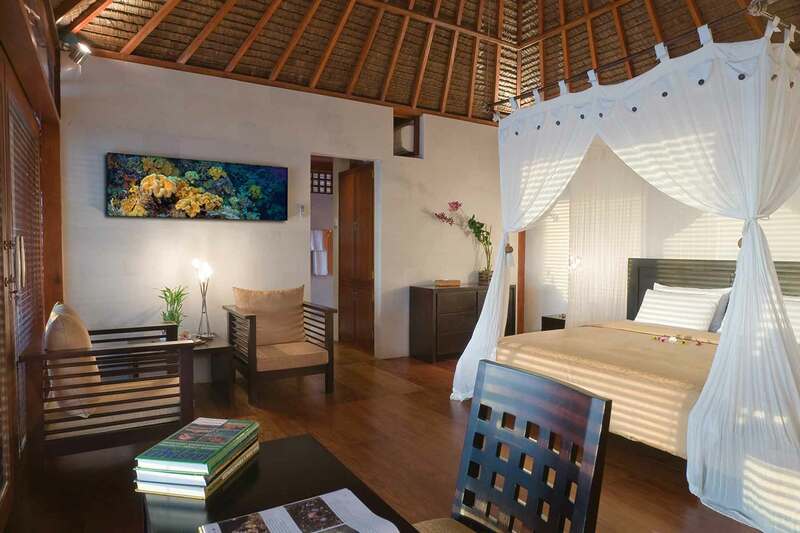 Wakatobi Dive Resort offers three types of accommodation – Wakatobi Villas, Ocean Bungalows and Palm Bungalows. 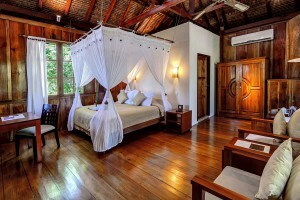 All of the accommodations have their own balcony as well as two lounge chairs for sun tanning and reading outdoors. Some also have a hammock between trees in front. Each room has a desk with internet access, a mini-bar, and much more. 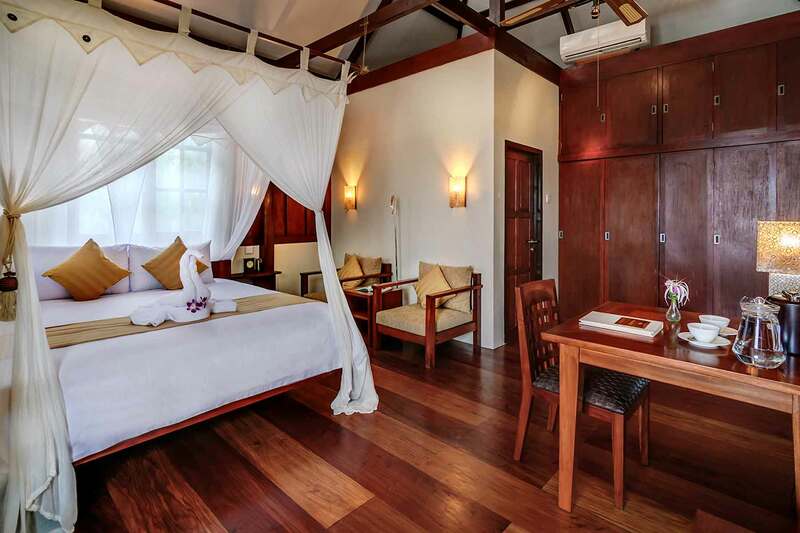 All rooms are equipped with air conditioning as well as ceiling fans. For those seeking the best – these are Wakatobi Resort’s nicest accommodations. 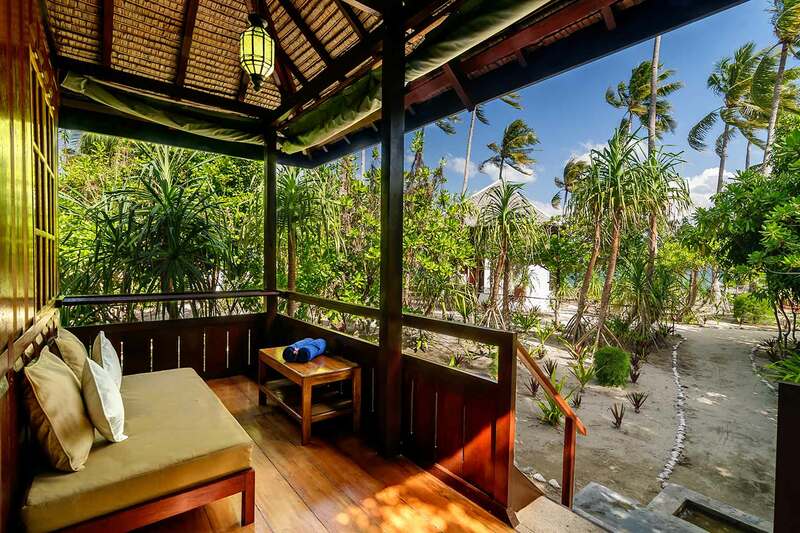 Located on the northern end of the resort beach and perched on small ledge just above the beach, Wakatobi Villas offer unobstructed views over the ocean and sunset, even from the bathrooms. Each villa is classically designed and constructed of earthy materials such as wood and sandstone. They are more spacious than any of the other accommodations and are decorated for ultimate comfort and relaxation. Wakatobi’s Ocean Bungalows are located directly on the beach. See the fish jump, hear the gentle waves and listen to the birds – all while seated on the balcony or in one of the comfortable lounge chairs in front of your bungalow. They all have huge front porches with comfortable lounge beds/cushions and stunning views. They also have indoor bathrooms and huge Asian spa-style outdoor showers. The Spa at Wakatobi Resort offers an extensive range of treatments, including Balinese massage, aromatherapy, facials, scrubs, manicures and pedicures. All Wakatobi’s oils are natural virgin coconut and virgin olive oil based, with the choice of your favourite essence to enhance your treatment. 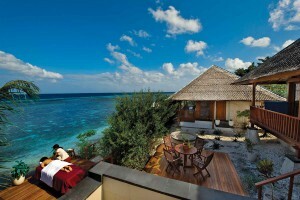 Wakatobi Resort’s restaurant is where you can enjoy a premier dining experience in a relaxed yet elegant setting. Their team of professional chefs are highly trained and have years of experience working in other first class resorts and restaurants before joining the team. The food served here is an international blend, combining Indonesian delicacies and flavours with dishes from around the world. For those that are adventurous there are exotic dishes and for those looking for comfort foods those are available as well. There are always multiple choices of starters, main courses and desserts. If you have special dietary needs their chefs will happily accommodate you. This is true whether it’s a food allergy or simply a preference. 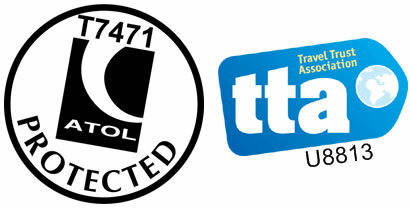 They are used to low-carb, vegetarian, low lactose or gluten free etc. Wakatobi Resort’s jetty bar is a great place to relax and watch a fantastic sunset after a day of diving at Wakatobi. The staff can mix your favourite drink or offer you a selection of fine wines. If a cold beer is your favourite they can make it happen. The dive center at Wakatobi Dive Resort is staffed by a diverse and highly professional group of instructors and assistants who together speak over nine languages and are qualified to provide everything from basic instruction and refresher courses to advanced and technical training. 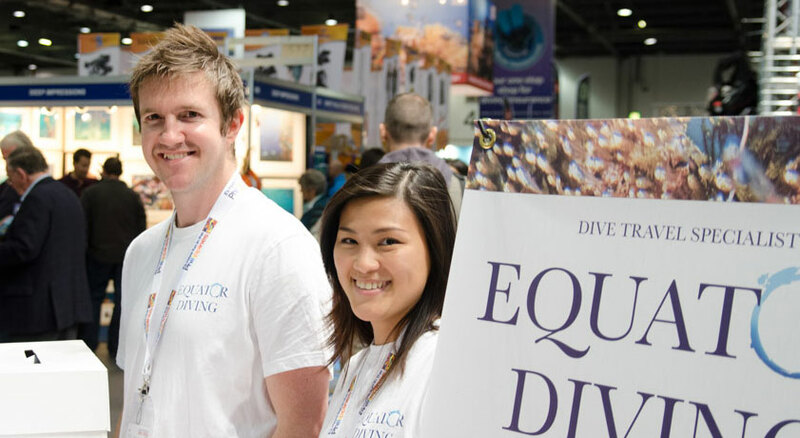 A full range of rental equipment is available, including Nitrox and oxygen to support technical and rebreather diving activities. Photographers are provided with a separate climate-controlled room with ample workbench space and numerous recharging stations, along with custom support and private photography workshops with Wakatobi’s in-house photo pro. There are 40-plus dive sites in close proximity to the resort offering drop offs, seamounts and caves with a myriad of fascinating marine life. 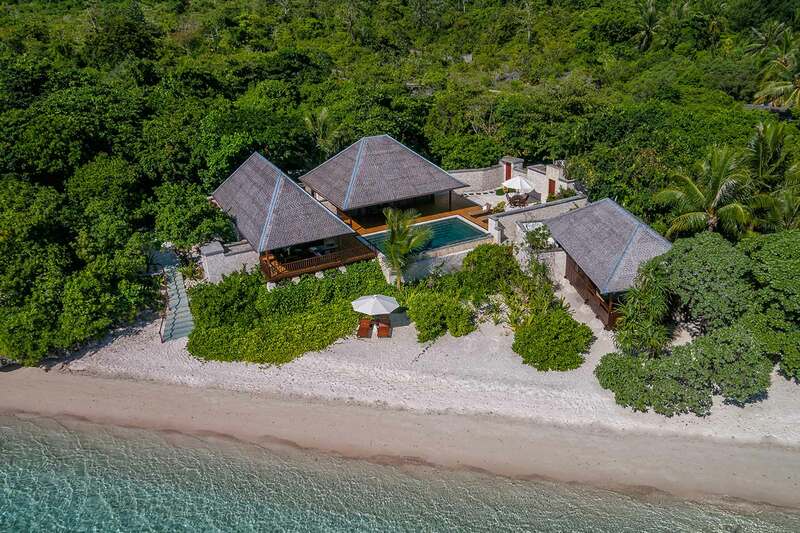 Renowned as “one of the world’s best shore dives,” the resort’s four-mile-long house reef explodes with a flurry of color and activity just steps from each room. Guests can dive, snorkel and explore pristine coral seascapes and enchanting marine life at a leisurely pace. A fleet of spacious dive boats and “dive taxis” provide up to three boat dives per day, plus unlimited shore diving with ongoing transport to the more distant portions of the expansive house reef. Guests rave over Wakatobi’s Fluo-dive experience, which shows the hidden colours of the reef in a whole new light. Wakatobi Dive Resort is home to their luxury dive yacht – The Pelagian Liveaboard. The Pelagian offers 7 night trips to the outer reaches of the Wakatobi National Park, allowing you to dive islands such as Wangi Wangi, Buton, Kapote, Hoga, Binongko, Kaledupa and Tomia. For more information on Pelagian please visit our Pelagian Liveaboard page.